Bangkok: Saina Nehwal and B Sai Praneeth will start favourites when India begin their campaign at the Thailand Grand Prix Gold, starting with the qualifiers from Tuesday. After missing the Sudirman Cup mixed team championship to attend to her ailing father, Saina will be itching to add another GPG title to her kitty after claiming the Malaysia Masters early in the year. Seeded second, Saina will open her campaign against unheralded Martina Repiska of Slovakia and the World No. 10 should reach the quarters without breaking a sweat. A few good players – Canada's Michelle Li and fourth-seeded local player Busanan Ongbamrungphan – are in the second half of the draw. If Saina can reach the finals then perhaps former world champion and top seed Ratchanok Intanon will be standing between her and the title. Newly-crowned Singapore Open champion, Praneeth, on the other hand, will look to consolidate his position in world badminton with another good performance. 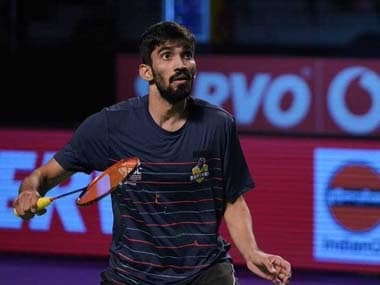 It was a moment of glory for Praneeth when he defeated fellow Indian K Srikanth at the Singapore Open finals last month and he would look to continue the winning momentum when he takes on Indonesia's Nathaniel Ernestan Sulistyo. Commonwealth Games bronze-medallist, RMV Gurusaidutt will also be returning to action after a long injury lay-off which saw him battle a nagging ankle problem before going under the knife for the same last year. Gurusaidutt will face Indonesia's Panji Ahmad Maulana in the opening round, while his training partner and Commonwealth Games gold medallist Parupalli Kashyap will square off against Milan Dratva of Slovakia. The tournament will showcase a number of Indian shuttlers, including Sourabh Verma, Joshi brothers – Pratul and Aditya –, Mumbai's Harsheel Dani, Shreyansh Jaiswal and Rahul Yadav Chittaboina in men's singles. In women's singles, national champion Rituparna Das, Ruthvika Shivani Gadde, Reshma Karthik, Sai Uttejitha Rao Chukka, Saili Rane and Sri Krishna Priya Kudaravalli will also participate in the tournament. Among other Indians in doubles, eighth seeded women's pair of Jakkampudi Meghana and Poorvisha S Ram, the men's combo of Arjun MR and Ramachandran Shlok and Francis Alwin and Kona Tarun will also be in action.